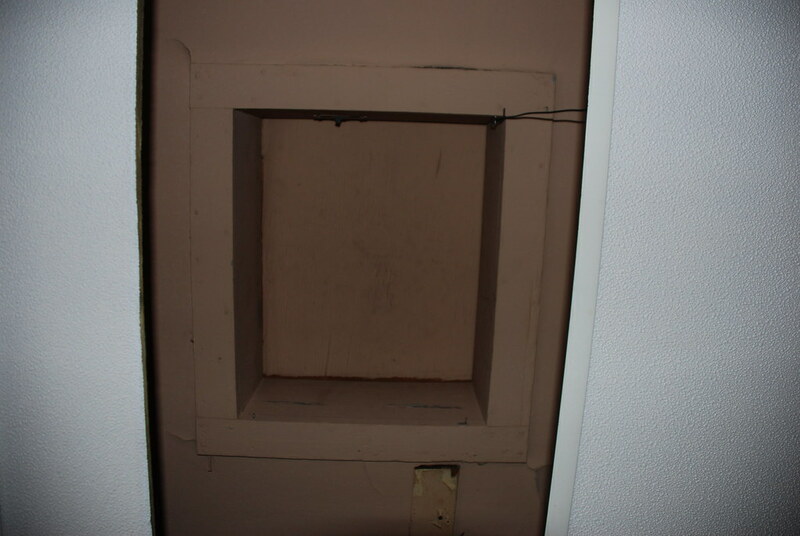 This is the hatchway to the attic in the front part of the house. It is located above the drop ceiling in Thurston’s room. I have another attic over the back part of the house, but more on that later. This hatchway is only 19″ x 23″! I’m going to have to crawl up there in order to disassemble my leaking chimney. I’m am SO NOT looking forward to this. I’m trying to think of it as an adventure. I’ve never actually been up there, and to be honest I didn’t even know it was there until about a year ago. I’m still waiting to get an estimate from the chimney guy, hopefully he will call today. Then Dave and I have to schedule when he’s going to pull down the exterior chimney so the interior portion can be taken out. I had planned for this project to take about two weeks, and now I’m going into week three. Of course there is a lot more involved than originally planned. I am just focusing on how great it will look when it is done and not on the horrible mess upstairs just sitting there! Quick! Someone call VC Andrews’ ghostwriter!! The plot for the 74th sequel is hiding up there! Please be careful and try not to fall through the ceiling. Is there a floor in the attic, or just rafters? I know! Lord only knows what is lurking up there. I actually have no idea what is up there, I can’t get up there because my step ladder is not tall enough for me to safely boost myself up alone. When I had my home energy audit done the guy who did it went up there. He didn’t say a whole lot other than that there is several inches of blown cellulose insulation up there. I really don’t want to fall through! Before we moved to CT we lived in FL in a home we bought. It was only 7 years old, but it seemed every project held a surprise we didn’t anticipate. It’s par for the course with any house and definitely to be viewed as an adventure! Troll hole! I love it! I hope there aren’t any trolls up there, but I wouldn’t doubt it! Don’t worry, I don’t plan on going up there unless there is a least one person waiting down below to catch me! And you are right about home improvement projects having surprises! Everyone that I have done so far has had some sort of surprise. Can we have Caulk Talk in the Troll Hole? That would be a great show! The other thing I just realized is that it is probably going to be sweltering up there! Adam, you could just wear a Speedo and pretend you’re at the beach! >Quick! Someone call VC Andrews' >ghostwriter!! The plot for the 74th >sequel is hiding up there! lol. troll flowers in the attic!